sorts of psychological or neurological biases cause people to make choices that seem contrary to their best interests….That theory is now being put to the test […] in several countries including Denmark, France and, above all, Britain, where David Cameron has established a Behavioural Insights Team, nicknamed the Nudge Unit. The Nudge Unit has been running dozens of experiments and the early results have been promising. In one trial, a letter sent to non-payers of vehicle taxes was changed to use plainer English, along the line of “pay your tax or lose your car”. In some cases the letter was further personalised by including a photo of the car in question. The rewritten letter alone doubled the number of people paying the tax; the rewrite with the photo tripled it. Changes to language have had marked effects elsewhere, too. A study into the teaching of technical drawing in French schools found that if the subject was called “geometry” boys did better, but if it was called “drawing” girls did equally well or better. Teachers are now being trained to use the appropriate term. At the risk of sounding peevish, I have to ask: in what way is any of this stuff behavioral economics? Trying to figure out better ways of persuading people to do things used to go under the rubric of rhetoric, politics, or salesmanship. When did we suddenly decide that the kind of thing that marketing people have been doing for the past century is now a wholly-owned subsidiary of economics? I remember having the same problem with Freakonomics when it first came out. It was all interesting and breezily written, but most of it was nothing more than the application of clever statistical techniques to figure out how different incentives affect people’s actions. But unless we’ve all agreed that anything involving the study of human incentives is, by definition, economics, the title of the book is seriously misleading. Only a few of the chapters dealt with subjects traditionally viewed as economics. I’ve got nothing against the study of nudging. We should do more of it! But the steady colonization of economics into every area of human behavior should be put to a hard stop. I suppose that hardnosed politicians are more likely to listen to a “behavioral economics” pitch than a “marketing” pitch, but that’s not much of an excuse. Just because it uses math and deals with human behavior doesn’t make it economics. 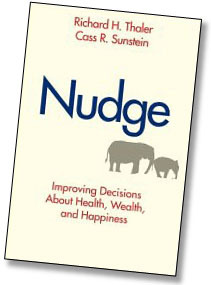 UPDATE: Richard Thaler, one of the co-authors of Nudge, tweets: “Not true of the book. The article is just a thin slice.” I didn’t really mean to implicate the book itself, which I haven’t read, with the Freakonomics problem, so apologies for that.